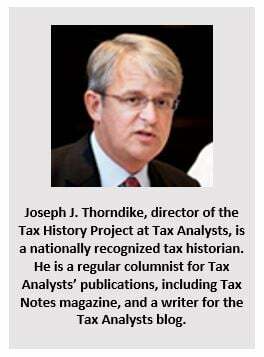 Joseph J. Thorndike, director of the Tax History Project at Tax Analysts, is a nationally recognized tax historian. He is a regular columnist for Tax Analysts’ publications, including Tax Notes magazine, and a writer for the Tax Analysts blog. Thorndike also has written for a number of national publications and academic journals. A prolific author on the history of American taxation, Thorndike’s latest book is Their Fair Share: Taxing the Rich in the Age of FDR, published by the Urban Institute Press. Thorndike serves as a visiting scholar in history at the University of Virginia and teaches tax policy at the Northwestern University School of Law. He holds a BA from Williams College and an MA and PhD from the University of Virginia.